Whilst not entirely modular (in that you can't just add more bits), this is a six oscillator, six envelope synth is pretty flexible, I think. As an analogue modelling synth, terminology is in terms of control voltages (abbreviated to "CV"). There are five modulators, a tone (timbre) generator, a filter section and an ADSR-controlled amp. The modulator inputs can be a fixed value (any of the five knobs) or from MIDI pitch, velocity or aftertouch. The MIDI values 0 to 127 are mapped to control voltage levels 0v to 10v. Of course, one input can go to more or more modulators. Each modulator has two optional stages - the envelope and the oscillator. 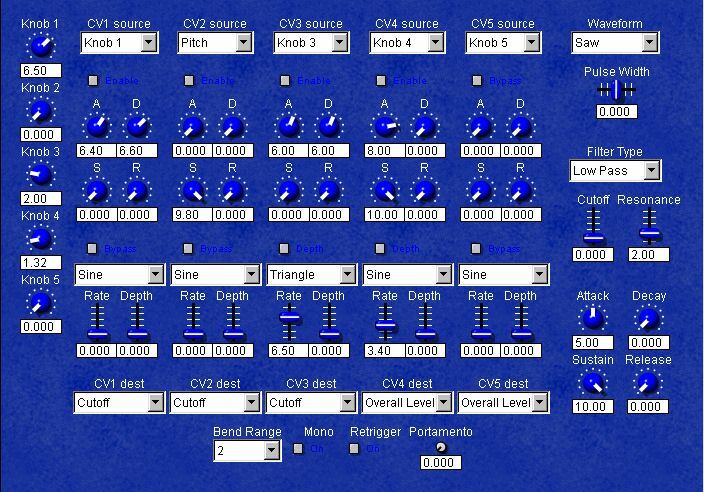 The oscillator sections can be used to generate a periodically varying CV. The incoming CV either affects (adds to) the oscillator rate or depth voltages. (In "bypass" mode, the output will be flat.) These are not just "low frequency" oscillators - they are full range. Stick below a rate of about 6v for "traditional" low frequency controls. Take care with depth - some effects require subtlety, particularly adding noise. Of course, one or more modulators can go to the same place. Finally, you can set the pitch bend range, envelope retriggering, monophonic mode and portamento time. And you can save the whole lot into any of 128 patches (FXP and FXB support). The "Brassed" patch is based on Sound on Sound's Synth Secrets' Mini-Moog brass patch. Surprisingly, to me, it sounds recognisably brassy - http://www.sospubs.co.uk/sos/jun01/articles/synthsecrets.pt26.asp. "Timpathetic" is based (very loosely) on the SoSSS MS20 patch but I'm underwhelmed. Maybe it just needs (lots) more fine tuning? Note that I'm using AM, FM, noise and whatever else I can throw at it to get it "ringing" right. It's just not working. http://www.sospubs.co.uk/sos/dec01/articles/synthsecrets1201.asp. To get all of Synth Secrets, go here: http://www.studiocovers.com/articles17.htm. If you really do want to expand it or rewire it, the SynthEdit project file is included! Pulse width ranges from 0% (flat, 0v) at -10v through 50% (square wave) at 0v to 100% (flat, peak) at +10v, I think.